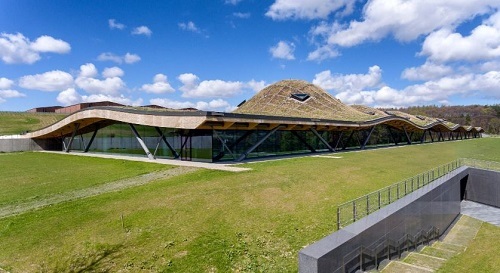 Undulations in the green roof of the Macallan Distillery by Rogers Stirk Harbour + Partners hint at the bulbous whiskey stills situated below. Cut into the hills of Speyside, the new distillery sits on the Easter Elchies estate in Scotland, which has been home to the single malt whiskey since 1824. The centrepiece of the whiskey-making building is a rippling timber roof formed of 380,000 individual components – almost none of which are the same.